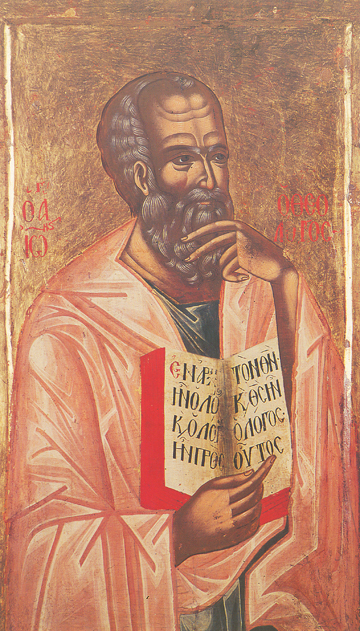 St. John is called both the Evangelist, as he wrote the fourth Gospel account of Christ’s life and death, and also the Theologian, as he soared like an eagle above this imperfect world in his love and understanding of the surpassing Divine Nature of the God-Man Jesus Christ, Whom he so eloquently proclaimed. St. John was the son of Zebedee, the fisherman, and brother of St. James the Greater, and both were two of the Twelve Holy Apostles who lived and ate with Christ, and then were sent out later to preach His Gospel to the whole world. Called also the Apostle of Love, St. John leaned on the breast of Jesus at the time of the Mystical Supper, where the Disciples would first receive Holy Communion of Christ’s Body and Blood even before He died for them and for us. Besides writing his Gospel of Christ, St. John also wrote three general Epistles, or letters to the whole Church, and the prophetic Revelation of things to come, all a part of the New Testament. St. John died when he was over one hundred years old, and simply laid down in a grave and was covered over. The grave was empty within three days.